Umphrey's McGee photo by Paul Citone. 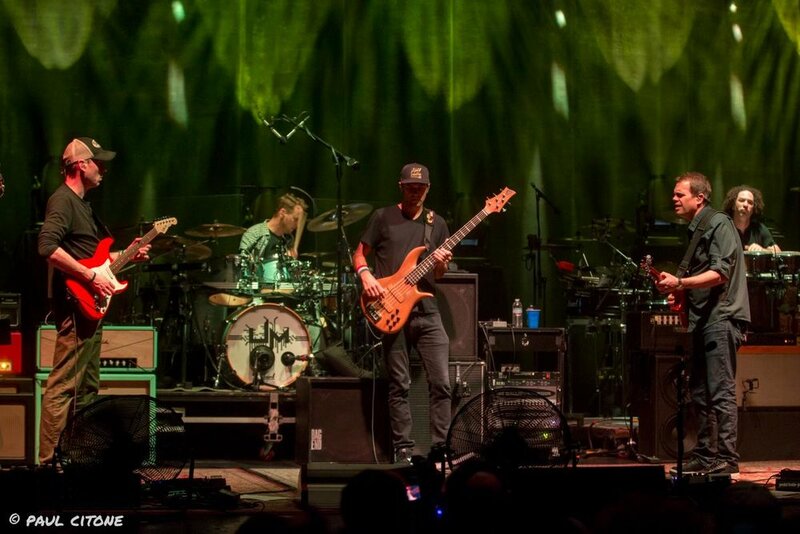 Umphrey’s McGee entranced the Los Angeles’ Wiltern theater for two, high energy-packed sets. 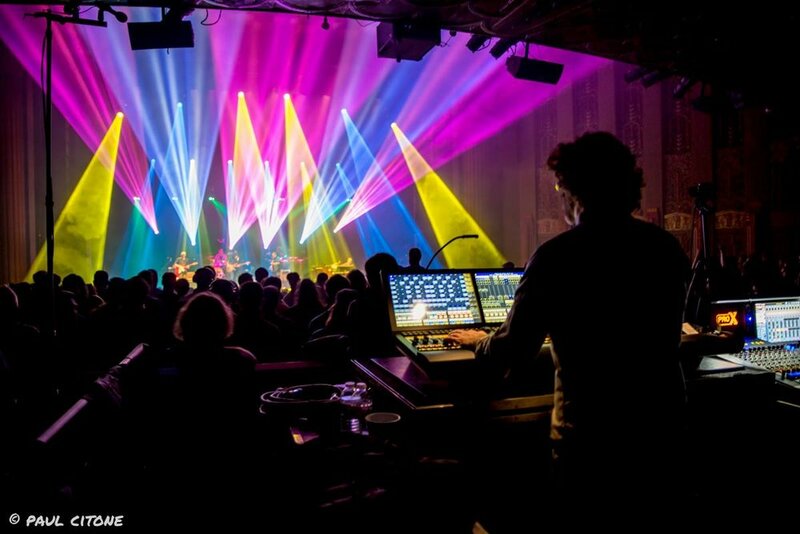 Amidst the hypnotic psychedelic light show and LED visuals, Umphrey’s McGee seamlessly weaves progressive rock, jazz, disco, funk, metal, and electronic genres into a cohesive dance mix. Each band member has a keen musical ear and an uncanny talent to communicate with each other on stage. If you’re not familiar with these technically adept musicians then you might be a bit overwhelmed. At any given minute, the band may take a blues ballad and feverishly drive it into a tripped out psychedelic groove. Their classic hits are consistently being re-worked into a whole new sound. The die-hard UM fans or “Umphreaks” will proudly express how each show is a completely different mind-blowing experience. Umphrey’s is known for their extended complex instrumental jams and abruptly switching songs mid way only to be re-visited later on in the set. Organ Freeman photo by Paul Citone. The opener, Organ Freeman heated up the night with some organ centered instrumental jams. Rob Humphreys (drums), Trevor Steer (organ, key bass), and Erik Carlson (guitar) manage to intricate a funky aesthetic into their peppy soulful grooves. The trio had everyone up and swaying to the beat. Umphrey’s came out next and launched right into the rock heavy hitter, “Dark Brush,” followed by the funkier “Bad Friday.” The first set comprised mostly of progressive rock melodies with Brendan Bayliss (guitar, vocals) and Jake Cinninger (guitar, vocals) alternating vocals between hard shredding electric riffs and bluesy stripped down rhythms. Jefferson Waful (Umphrey's McGee Lighting Designer). Photo by Paul Citone. After a twenty minute intermission, Umphrey’s returned with a more electronic trance fused second set, forcing everyone back up on their feet for “Wappy Sprayberry.” “The Floor” followed with Kris Myers (drums, vocals) and Andy Farag (percussion) flawlessly interweaving powerful percussions within the dreamy arrangements. Without warning, Ryan Stasik (bass) rips us back in to the rock n’ roll endeavor “JaJunk.” Before closing out the set, Umphrey’s treated fans to a transcendental rendition of the Talking Heads’ “Once in a Lifetime.” The performance left many excited whispers exchanged throughout the venue. From left to right: Ryan Stasik (bass), Brendan Bayliss (guitar, vocals), and Jake Cinninger (guitar, vocals). Photo by Paul Citone. 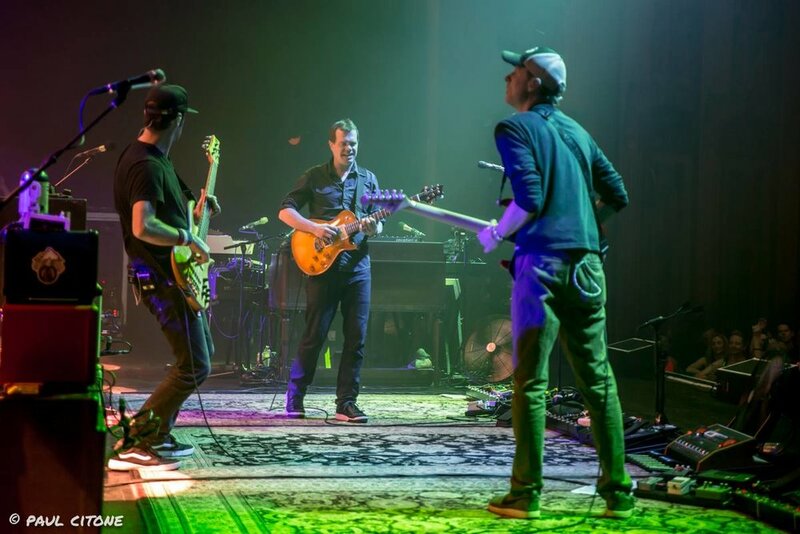 Umphrey’s McGee continues to astound with their precise technically crafted musicianship, their vast variety in sound over their discography and their ability to create sophisticated and fun-loving tracks to just dance to and enjoy. If you’re looking for a band that challenges the multi genre scope, Umphrey’s McGee is well worth the listen! 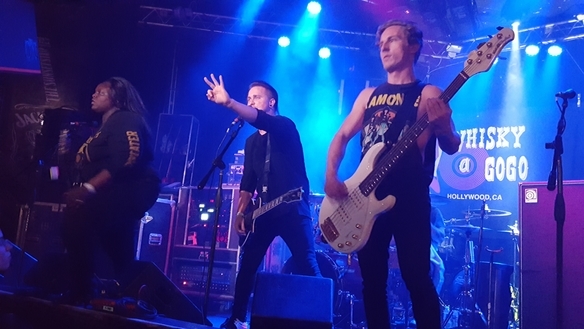 Tetrarch (from left: Ryan Lerner, Diamond Rowe, Josh Fore, and Ruben Limas). Tetrarch is a Nu Metalcore band on the music radar in Los Angeles. After interviewing Diamond Rowe and Ryan Lerner back in 2011 for the EP, The Will to Fight, I have been dying to see Tetrarch live ever since. 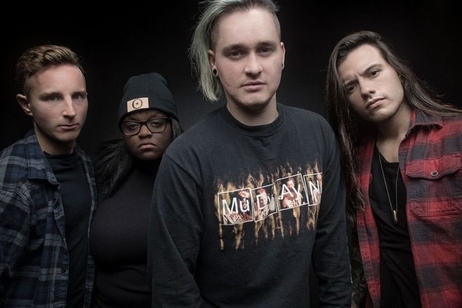 Reminiscent of Metallica and Korn, Tetrarch boasts self-reflective lyrics and jackhammering melodies. If you’re a fan of the intense and emotional, then look no further. Tetrarch recently finished their Summer/Fall tour with DevilDriver, 36 Crazyfists, Cane Hill, and Uncured. 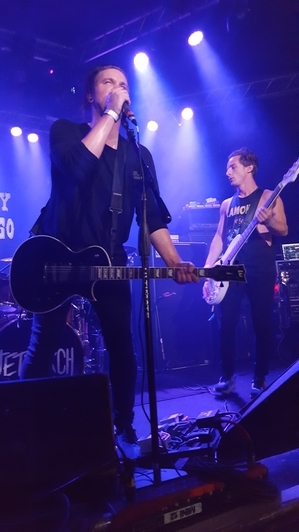 I managed to see Tetrarch open the show on Wednesday at West Hollywood’s Whisky A Go Go. From the moment, the four piece ensemble roared onstage bathed in a midnight blue light with the opener, “Break the Trend" off the new album, Freak, I just knew this was about to be a killer gig! Frontman/Rhythm guitarist Josh Fore reminded me of Linkin Park’s Chester Bennington vocally. Fore embodied Bennington’s angst filled emotions and higher belted screams. It was a shame there was not a large audience to showcase this talent, but that did not affect the performance. Fore kept the audience chit chat to a minimal to let the music speak for itself. “Oddity” was the second new song of the night. Fore and Bassist Ryan Lerner offered plenty of attitude, engaging the audience. The song served as a pissed off stick-it-to-the-man kinda anthem. You know, the type of song that makes you want to break things! The Whisky’s pit became lightning in a bottle with hand bangs and fists pumping at intense speed. I’ll never forget that one guy determined to out guttural scream the venue! “Relentless” was my favorite. The song praises one’s individuality despite what the haters may think. “Push me around with all the twisted words you speak/Feeding me lies just to please you/I’ll never be like you/Not like you,” Fore belted out to a cheering crowd. The band closed out with “We are the Hunters.” Lead guitarist Diamond Rowe, Lerner, and Fore waved their stringed instruments and head banged together in perfect unison. Watching Rowe and Lerner switch stage sides without missing a beat was an impressive feature. Ruben Limas was a powerhouse drumming machine that night. His broken drumsticks after the show proves he’s a force to be reckoned with! My only complaint was that the 20 minute set was way too short. A four song setlist just left me wanting more. After the set, I went straight to the merch booth to pre-order their newest album, Freak. The album officially released on September 29. I highly recommend it to all metalheads. Tetrarch’s music praises individuality with the confidence to back it up. No doubt that these guys will be the headliners soon.